More than any other single event, the Eichmann affair – from his capture and repatriation from Argentina by Mossad agents in 1960, through the landmark trial for war crimes and crimes against humanity, to his execution in 1962 – has served to shape the meaning and impact of the Holocaust in contemporary Israel. What though is often overlooked is the social context within which the trial was conducted, and the unspoken higher purpose that underpinned the detailed and meticulous preparations: This is our story. One might think of it as a deliberate attempt at shaping narrative, as much for domestic and for Jewish elucidation as it might have been intended for international consumption. 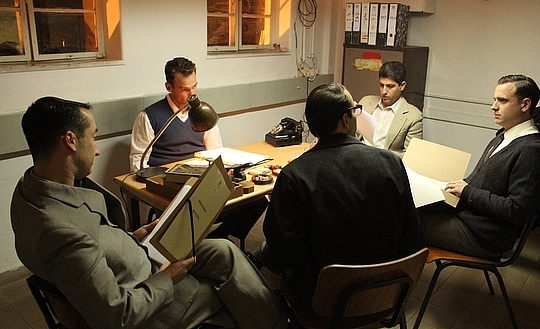 Filmmaker Yoav Halevy’s new film, Bureau 06 takes its cue not from the trial itself but from its facilitators: the specially commissioned group of investigators tasked with constructing the state of Israel’s case against Adolf Eichmann. Without especial technical knowledge of the events, all were inextricably bound to the subject matter as Jews, as Jews of German origin (fluency in German was a necessity, for interviews, interrogations and archival research), and as the representatives by proxy of a country that had not yet learnt how to process the horrors of the Holocaust, preparing the prosecution case for one of its principal architects. Halevy’s film, thoughtful and deliberately understated, relates the experience of Bureau 6’s members for the first time. In an email exchange last week, Halevy explains why he made the film now, what Bureau 06’s work meant for the country, and the lasting legacy of the Eichmann trial. Akin Ajayi: In some ways, this presents as an untold story that has hidden in plain sight for a very long time. What drew you to making a film about Bureau 06? Yoav Halevy: I started to work on the film Bureau 06 four years ago. It’s the story of a group tasked with investigating the crimes of Adolf Eichmann, cloistered together for ten months in the “cage” of 06, as one of the number described the experience. This story – which vanished from the consciousness of the public for various reasons – is, from one perspective, a dry documentary (a journalistic assessment of all the available information); but at the same time, there runs beneath this a story (one which we can all relate to), of Israeli society since the Eichmann Trial; the story of society (struggling to grow) in the shadow of the traumas of the Holocaust, with its foundations set in the same “cage” as Bureau 06, facing Eichmann. When Wim Wenders and Sam Shepard made “Paris, Texas”, we follow the hero of the film, Travis, as he goes to the place where he thinks he was “created”, the meeting place of his parents. This is the place that I tried to reach too. This place does not exist in a physical sense, but is rather an image that has accompanied us since the Eichmann trial. A “place” (in the dramatic sense) where we can deduce that the collective Israeli memory of the Holocaust, which burst forth at the time of the Eichman trial, was created and cast. (I was born in 1963, two years after the trial, but it still echoes, like a shadow biography that accompanies me and the members of my generation.) This place, a type of melting pot of the mind, was cast forever in the hearts and memories of the people in the film, who reveal before the empty “glass booth” a different, more complex image, that is not one dimensional, as befits an event of this stature. Human faces. Human memory. Akin Ajayi: It seems very strange now, but some of your interviewees refer to the absence of a shared discourse concerning the Holocaust before the period covered in the film. How important, in your opinion given your long association with the material, was Eichmann’s capture and trial for the nation’s psyche? Haim Gouri, “LaMerhav” newspaper, 10 September 1961. Akin Ajayi: Following on from this: there is a very specific insistence on order and procedure – the Rule of Law, if you like – prevailing over emotion and sentiment. Why do you think this was important, and do you have the sense that in a way there were two trials: the official legal proceedings, which were uncertain in outcome, and the court of public opinion, which was very unambiguous from the start? And what if the two had reached different conclusions? Yoav Halevy: As Yoram Kaniuk observed, one could try and convict Eichmann on his actions alone. The trial was a historical statement, with a historical vision, allowing a space to hear the statements of the victims for the first time. It was “The Nuremberg of the Jewish people.” It was a decision made by the prosecution, whereas the police wanted something more limited. Most of the witnesses did not know Eichmann, and certainly did not see him face to face. The Police recommended about 50 witnesses (some duplicating testimonies of the same event), whereas in fact there were about 110 witnesses at the trial itself. This confirms that there was a decision to turn the Eichmann trial into an historic, consciousness-changing trial, to change the Israeli agenda and the agenda of the Jewish world in general. In any case – and this I think should be understood – Eichman was convicted, and convicted on the basis of the documentation and the work that came out of the investigations of Bureau 06. In addition – it can be understood that in any case, this awareness of the Holocaust would have erupted in the context of Israeli culture. It is impossible to prevent or to block a trauma of this magnitude from bursting forth? It was a seminal event for the nation and the people. Concealment was dishonest, placing a band aid on a broken and crushed body. Thus, from a historical perspective this was the breaking point; but certainly, even if there had been a smaller trial, more specific in context and content, it would have still broken through in other ways, albeit unpredictable. Akin Ajayi: Let’s think a bit about your interviewees, the operatives of Bureau 6. An enormous responsibility was placed on their shoulders, to prepare a legally water-tight case against Eichmann. It’s clear from your film that the pressure wore at them as they prepared for the trial, but do you think they were – they could have been – prepared for this immense responsibility before they started? Yoav Halevy: Absolutely not. They were not prepared because no-on could predict what they were going to uncover. All that they could know was that they were standing on the crossroads of history. It was a defining moment, both for themselves and for Israel. We are talking about relatively young people, all between 22-30. Most of them were products of the dominant Israeli culture of the time, that is to say they ignored the Holocaust. We are also talking about the period 1960 to 1961, 15 years after the end of the Second World War. A long time had passed. But from the moment they engaged with the subject, they were swept up, it was impossible to stop the intensity, the obsession that enveloped them in their effort to know as much as they could, to uncover as much information as they could in a very limited time span. They read thousands of documents that had been gathered from archives around the world, locating, translating and reading day and night. (At that time, there were few published books, which in turn relied on the one or two books written about the Holocaust, which were not without mistakes themselves). The work they carried out was phenomenal, particularly when taking into account the lack of clear knowledge and order, and they turned into experts in the subject matter, working as though they were professional historians on the matter of the Holocaust. Today it is clear that their work created a structure for the study of the Holocaust, at least as we know it today. It was not by chance that Hannah Yablonka claims that they conducted the trial, and nobody else. Akin Ajayi: Today, we have a much clearer understanding of the psychological impact of such charged, emotional work. Their task was multiplied many fold by the personal connections that some had to the camps. Was there any formal support mechanism either during or after the trial? Yoav Halevy: No. There was no “support” in the sense that we think of this today. The concept of “psychological treatment and support” was not established at the time, and certainly not in an organisation like the police. They were police investigators from a range of subjects – Avner Less, Eichmann’s personal interrogator had been an investigator of white collar crimes, for example. The point was the personal capabilities of the investigators and obviously the German language. One might say that the sense of a social structure, the fact that they were not alone and in fact worked as a team (despite the fact that each one was responsible for a different subject), gave them a kind of “emotional support”. Additionally, there is the understanding that the head of Bureau 06, Avraham Zelinger and Ephraim Hofstadter were impressive people, in that besides being highly regarded investigators, they also had an understanding of the human soul. And they knew how to demand but at the same time how to let go, how to create the desired balance (For example, the reconstructed scene in the film where they are told to stop and gather mushrooms on their way home, after having spent a week entombed in prison with Eichmann). Yoav Halevy: The film isn’t really about this, but yes. They stayed in touch with one another. It obviously wasn’t that they all remained touch with one another, but deep friendships formed over the years. They all went in different directions, some moved abroad, some died, and Ephraim Hofstadter was murdered (he was the Israeli Ambassador to Turkey, changed his name to Al-Rom and was murdered by terrorists), but they certainly remained in contact. One can deduce this because despite the veiled criticism from some quarters following Avner Less’ departure from the country, they still remained in touch with him. It should be understood that the involvement of the people with the subject shaped different opinions, sometimes contradictory opinions (and the film touches upon this) but despite this, the human warmth of a group of people who passed through a powerful formative experience, remained with them forever. Akin Ajayi: Avner Less’ response – reclaiming his German identity and moving back to Germany – sounds like a remarkable act under any circumstances. It is, obviously, a unique response bourne out of personal circumstances. I wonder what you, as a director and having had the opportunity to interview his son, make of this. Yoav Halevy: Avner Less is first and foremost, an individual situation of a person born in Germany, who is connected with all his being to German culture. The film, obviously, raises the issue of people connected to an idealistic representation of German culture. The “Yekke” culture. It was an irreconcilable conflict. The culture that one admires, a part of one’s soul, but also the culture that rejected one. Avner Less tried all his life to reconcile this conflict. This conflict expands the issue of the human response to the Holocaust. It was a response that was not part of the Israeli consensus and thus opened him to intense criticism. Criticism which, in my opinion, was “childish” and arrogant (although it was also relevant, given the context of the Holocaust). Avner Less existed between two cultures on a personal level, a as a result suffered personal losses, but could not exist otherwise. His act was authentic, and in this context, this is important. There is no “correct response”. There are authentic responses to such a dramatic event. The film relates the story from a sympathetic perspective. An empathetic perspective. Not as criticism, but rather as acceptance. Each man to his own path. Akin Ajayi: And in a more general context, I wonder what impact working on this material over four years has had on you as an individual and as an Israel. Has it demystified or complicated the Eichmann presence in contemporary Israeli history? Do you think the State of Israel managed the trial correctly? Do you think that the public discourse about the Holocaust might have shaped differently, had the Israel government managed the trial differently? Yoav Halevy: About the “correct verdict”, I have no opinion. It is not for me to criticise a historical event. That’s what it was, an authentic event, not an outlandish event or a show trial (as, unfortunately, some people have suggested). But I have no doubt that today, 50 years on, we have to develop and widen public discourse concerning the Holocaust. Today, even though there are extensive and detailed responses to the Holocaust, Israeli public discourse concerning the Holocaust has narrowed, closed, has turned almost into populist discourse. The word “Holocaust” has become common currency, a concept that turns up on every street corner, used in every ideological conflict, and this saddens me. There are formative historical experiences that should be approached with humility and reverence. When one talks about an event of such enormity, a human experience so central to the understanding of humankind, full weight must be given to its complexity rather than considering it in a simplistic way. Screening times: Monday, July 8th in Cinematheque 3, at 20:15. Bureau 06 will be screened at the Jerusalem Film Festival in the Jewish Experience, to see the full list of films screened in this program, click here.